Olympique Lyonnais have only taken four points from a possible nine so far this season, a far cry from the start they were hoping for. Lyon can take solace in the fact that both Monaco and Marseille have also had similarly lackluster starts, two clubs who think they should be part of Ligue 1’s top three. Lyon have been uninspiring over the last five halves of play, and Rennes helped contribute to that with a compact showing defensively away from home. Stade Rennais had a pretty defensive lineup going into the match, even by their standards. Pedro Henrique started as a makeshift striker, despite usually operating as a winger. Former Lyon player Mehdi Zeffane was put into the starting lineup, but as a left sided midfielder in front of the back five, instead of as a fullback. As the game kicked off, Lyon immediately took up their narrow 4-3-3 defensive shape. However, normally Lyon would prefer to have the front three in wider positions, defensively. Lyon at their best like to press along the flanks and the sidelines, giving them opportunities to regain possession and possibly launch attacks the other way. Rennes aren’t known for their pressing, and are certainly not in the same category as Marseille last season under Marcelo Bielsa. Their defensive style is more similar to the likes of Nantes & Saint Etienne, who prefer to do their defensive work in the midfield and allow the opposition time on the ball in non-dangerous areas. However, Rennes’ manager Philippe Montanier had Rennes press the Lyon backline continuously, particularly in the first 20 minutes. This led to Lyon making questionable decisions and forcing potentially dangerous turnovers. The result of this was that Lyon were unable to establish rhythm to their attacking play. Lyon prefer to utilise the central areas, more so than most Ligue 1 sides, and the width is provided from a combination of their forwards drifting wide, or fullbacks bombing up the touchline to create overloads. At their best, Lyon are able to blend the centrality of their attacking players with the width from the full-backs (Rafael & Bedimo) into a fluid attack. 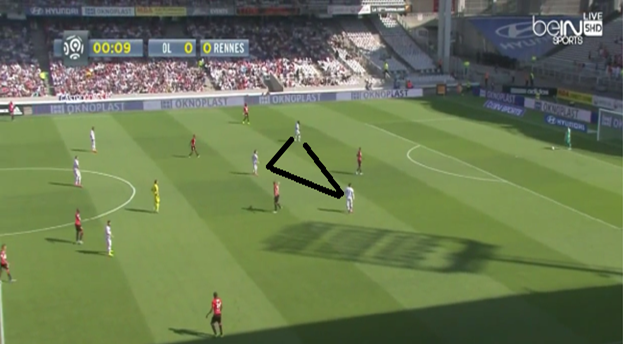 Rennes recognised this, and seemed to dare Lyon to beat them only by attacks starting from the outside; the clogged up the centre of the pitch, so only simple options were taken by Lyon to keep possession of the ball. The first goal by Pedro Henrique came just a couple of minutes after, via a mistake from Mapou Yanga-Mbiwa & Jordan Ferri. The goal was a reward to Rennes for their determination and tactical preparation coming into the match. As the game moved further along, the intensity of the Rennes press slowly started to decrease. It wasn’t necessarily because of the positioning of the front five from Rennes, as they still were fairly high up the pitch. Henrique didn’t change his positioning but allowed the backline of Lyon to make passes. Nabil Fekir became a more central threat and Lyon were able to hem in Rennes into the final third more often, evidence by the 180 final third passes that Lyon created (the highest mark from a Ligue 1 team so far this season). One of the staples of Lyon’s offense is how high up the pitch the likes of Rafael and Bedimo are positioned, to provide additional width when Fekir & Lacazette don’t drift out wide. Lyon aren’t a very cross happy team (they were in the bottom three last season in crosses per game and chances created from crosses), but Lyon use this width to create 2v1s on either flank when the middle is unavailable to build through. 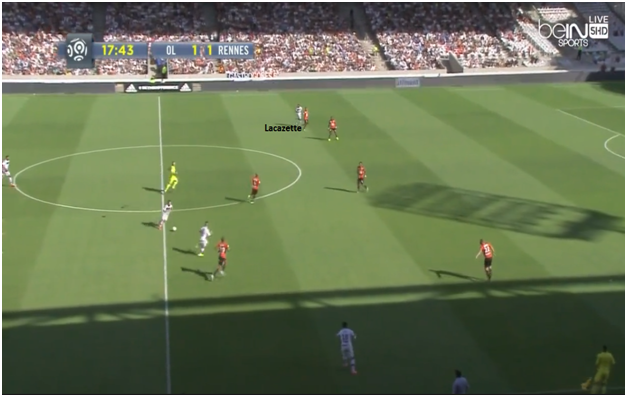 We saw similar things with Lyon after the Rennes opening goal, as they started to involve their fullbacks more often in an effort to bypass the middle of the pitch. 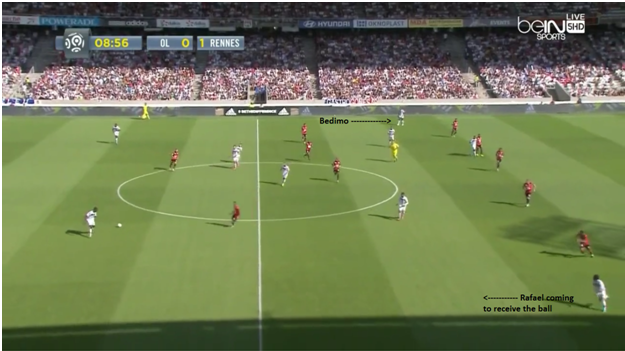 While Rennes did a solid job in plugging the middle, there were a few attacking moves from Lyon that posed trouble for them, and they were all built from wide areas. The goal from Fekir was through a combination of Bedimo cutting inside in a failed 1-2 combination with Lacazette, Jordan Ferri’s high positioning on the right hand side and another forward run from Rafael. It was somewhat fortuitous that Lyon scored despite the good things they did to unlock Rennes’ defense. The cross from Rafael on the right hand side was deflected onto Fekir, whose shot was also deflected past Costil. It was interesting to see Lacazette’s positioning throughout the entire match. At his best, Lacazette can perform both as a striker who comes from the outside-in or inside-out. Lacazette wasn’t close to his best against Rennes and seemed to prefer cutting inside from wide areas. His performance more reminiscent of his earlier days as a winger than the striker of 2014-15. One of the rare opportunities where Lacazette was able to effectively come from the outside-in was when he, Valbuena and Fekir combined on a lovely interplay that nearly resulted in a Grade A chance for Lacazette. Some of this was due to Rennes’ defensive outlook, overloading the midfield and essentially gifting parts of the flanks, especially in the midfield. But also key was Rennes controlling the tempo of the game. Lyon ideally like to play a mixture of a quick tempo attack combined with doses of methodical football that’s more focused on creating throughball opportunities. Rennes forced Lyon to play the majority of the match as the latter, trying to break through against their defense, especially when they sagged back and dared Lyon to break them down. Lacazette thrives on controlled chaos because his speed and strength combined with his quick shooting ability makes him a nightmare in those situations. He’ll find the spaces in between the CBs and make runs into the penalty box, which his teammates found last year in high abundance. Those runs weren’t available against Rennes, and the slow pace meant he couldn’t thrive in that vacuum, another feather in the cap to Rennes and their defensive outlook. Rennes did a solid job defensively against Lyon. They weren’t perfect, but they forced Lyon to play a predominantly slow paced match, and they did a good enough job in limiting the opportunities that they created. Lyon are averaging 5.33 shots in the danger zone area (the center of the penalty box) this season which is 4th best in Ligue 1. Lyon attempted six versus Rennes, right around their league average. It’s fair to say that Rennes were a bit lucky in nabbing two goals out of only six total shots, particularly considering that the shots were arguably stoppable on Lyon GK Anthony Lopes’ part. But one might argue that Rennes deserved that bit of good fortune for what they did to Lyon with that defensive lineup. Zeffane was great in his return to the Stade Gerland and did a surprisingly great job as a left sided midfielder. He assisted on the first goal and scored the winning goal. It’s too early to predict doom and gloom for Lyon, especially considering that they faced similar struggles at the start of last year’s campaign. They do not look anywhere close to the side that took Ligue 1 by storm last year, but time is still very much on their side. Rennes came to the Stade Gerland with a plan and executed it. 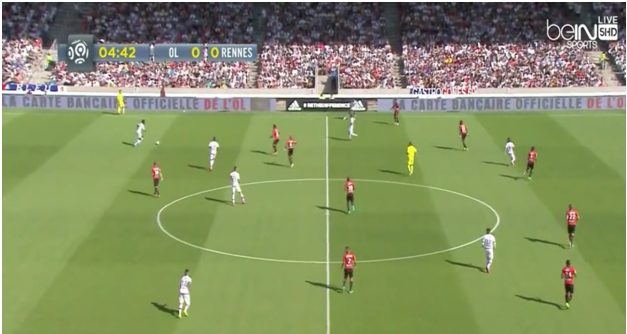 The focus on defensive & compact football worked well for Rennes, and may provide a blueprint for other Ligue 1 teams to use against Lyon throughout the season. Awesome to see French football tactical analysis on this site. I don’t really follow french football, so it’s interesting to see these tactical pieces. 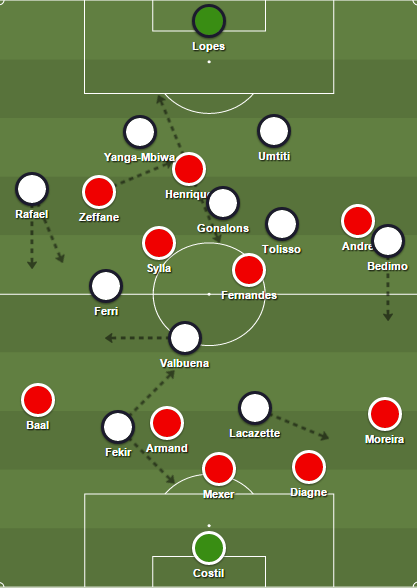 Well written piece 🙂 With the players Lyon have down the center of the pitch, you’d understand why they play so centrally, but it seems like the fullbacks could offer more in terms of attack dynamic.